Peterlee offers a wide range of shops and facilities and not just in the main shopping centre, known as Castle Dene Shopping Centre, but throughout the town. Small ‘community’ shops are dotted throughout the town ensuring that your grocery supply, newspaper or the latest cut and blow dry is never far away. 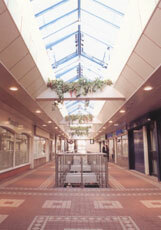 Castle Dene Shopping Centre in the town centre is owned by Oracle Estates, whose head office is based in Surrey. For information relating to the Shopping Centre, please contact the Town Centre Manager’s Office on 0191 587 2753 or view the Castle Dene Shopping Centre website.